Who’s Coming Up on Monday, February 6? 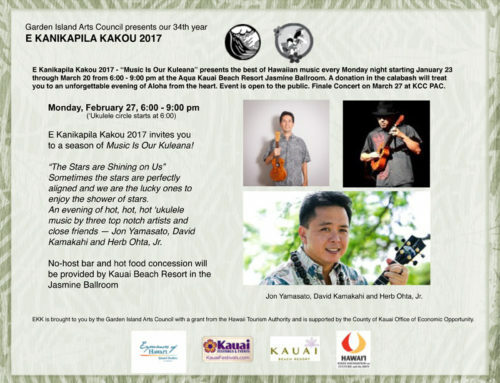 Grammy Nominee for “Best Regional Roots Music Album”, Kalani Pe’a shares with you a delicious evening of Hawaiian music titled “E Walea Under the Moonlight” — Enjoy and be Exuberant Under the Moonlight — with his Band members Mark Vaught and Henry Koa, before dashing off to the continent to perform at the 2017 Grammy Awards. 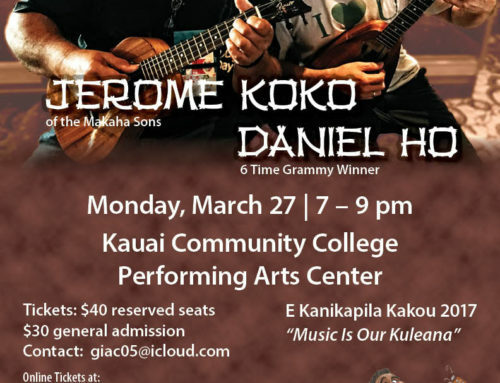 Sam and Joe Bonnano of Kamoa ‘Ukulele team up to share their ‘ukulele expertise with the 6:00 – 7:00 ‘Ukulele Circle. It was a perfect EKK night, and many were moved to tears as they walked out of the recently renovated Jasmine Ballroom, experiencing the songs and hula of a gifted Kumu Hula and her ‘ohana. Under the white icicles décor hanging from the soft blue recessed light fixtures, the story of Kapu Kinimaka Alquiza’s Life of Hula and Music was shared with the appreciative EKK audience. Kapu led the entourage from the back of the Jasmine Ballroom, her dancers and musicians first chanting and then singing in unison until they took their places on the stage. Auntie Bev Muraoka, one of Kapu’s early hula mentors, looked regal in her white muumuu topped with a dark purple kihei. She chanted from the stage as she received the performers. She and Uncle Nathan Kalama asked the audience to take a moment … a long moment … to honor and recognize the untimely passing of one of Kauai’s beloved kupuna and healer, Auntie Angeline Locey. For years Auntie Angeline’s beaming face in the first row, embodied the appreciation and joy that the entire audience felt each week. EKK was one of the biggest joys in Auntie Angeline’s life. She left us the day after the first night of EKK 2017, but she was surrounded by loving ‘ohana, music and hula in her final days at Wilcox hospital. Although it was an impromptu ceremony, Auntie Beverly Muraoka and Loea Uncle Nathan Kalama shared the proper Hawaiian protocol with a Kanikau, or lamentation, in a manner most appropriate to honor a kupuna who spent her life healing others. Nathan began with an oli that greeted everyone present. Aunty Bev responded with her powerful delivery of the pane or reply followed by Nathan with a hand clapping oli. The chants went back and forth until Bev ended with the final response on behalf of Auntie Angeline. She called on any ‘ohana or haumana of Auntie to come up and receive a lei made by Fran Nestel. Angeline’s son, Steve Locey, moved to tears, came up to receive the lei. He represented the many who knew and loved Angeline, her loving demeanor and healing hands. We will certainly miss seeing her in her bright red muumuu, sitting with a soft smile and twinkling eyes in the front row, often presenting someone with a puakenikeni lei that she had sewn. The audience, although they may not have understood the words, were aware they had witnessed a special moment; many were moved to tears. 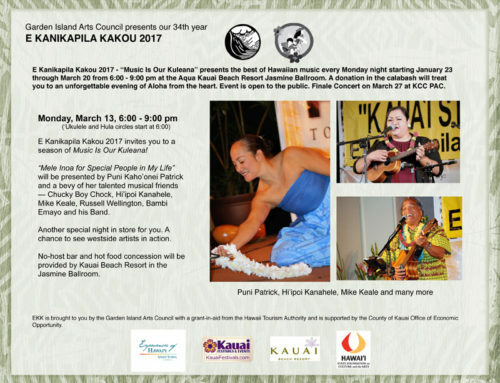 Auntie Bev turned the mic back to Kapu, the embodiment of “love, devotion and energy.” A statuesque beauty, dressed in a black off-shoulder holoku set off with her Niihau shell lei and full lei po’o made of croton leaves, Kapu introduced her musicians – Wes Kaui, Beverly Kauanui, soloist Robbie Lynn Contrades, Maha Leoiki, and Vanya Fagasa. At age five, Kapu was encouraged to dance the hula by Auntie Beverly Muraoka’s sister, Auntie Lovey Apana. Kapu recalls being a little girl taking hula lessons and getting her share of “lickin’s of love” from a very strict but fun-loving Auntie Lovey. She confessed that she took a bribe of $5 (which at that time was a very big amount) from Aunty Bev to come and dance the hula, and she has been at it ever since.That five dollar bill likely delivered the biggest bang for the buck when you look at the generations of hula dancers on Kaua’i and in Japan that have matriculated for the past 57 years under the strict but loving guidance of Kumu Kapu. Kapu says, “Being connected to hula is like a marriage. Once you commit, you can’t just pull away.” Hula has taken her around the world – all over the mainland, Canada, New Zealand, Australia and Japan. Her sister was her partner in hula so when Kapu decided to get married to Pete Alquiza, her sister was not a happy camper to lose her partner. Husband Pete has been Kapu’s staunchest ally through thick and thin. Uncle Joe Kahaulelio was her primary mentor and kumu. Most of the music shared by Auntie Kapu were songs that she had composed over the years. She shared the stories about how each song came to be written from her own memorable experiences. Bringing the songs to life with their hula were her dancers – Nicky Lee, Ala Alquiza, Leoaka Thomas, Melodie Ueno, Puamohala Newall, Haru Menor, Sheanna Mata, Jassy Oligo, Jacey Oligo, Malu Kenney-Alquiza, Kawehi Kahananui, and Kiana Young. Ever the generous spirit, Kapu invited anyone who wished to know more about her songs to email her and she called out her email address to the audience. Kapu started out, “I am not ma’a about song compositions but real life experiences inspired me to write these songs.” After taking a songwriting workshop from Kimo Alama Keaulana, she was moved by the beauty of Niihau island across the calm crystal blue ocean from the shores of Kekaha. Impressed by the labor of love of Niihauans endlessly picking up shells on the beach and stringing them into beautiful lei, Niihau I ka Malie was composed in February 2015. Her dancers translated the song with a beautiful hula. She teaches her dancers that “The hula expresses stories through hand motions and gestures. It allows one to express inner, heartfelt feelings about people, places and things.” She taught them well. At the opposite end of the island at Ke’e Beach is Ke Ahu A Laka hula mound which Kapu and her dancers love, respect and appreciate. She did not know why she was summoned to go there at 4:00 in the morning, but her mele aloha, Haena Ika Lai, composed in December 2014, came about after this pre-dawn visit to the hula mound. Sung by soloist Robbie Lynn Contrades, it captured the reverence Kapu feels for the place. Kapu recalls a special friend from Japan who taught himself to play the steel guitar. Although they experienced a language barrier, they were able to communicate. For years he danced hula that came from his heart, but as the Hawaiian hula gained popularity in Japan, he became aware that his hula was not truly Hawaiian, so Kapu became his kumu for twenty years. One evening they held hands and walked along the Meganebashi or Spectacle Bridge, which look like eyeglasses. “I never told my husband about this,” she joked. From this experience came the song Matsuyama Moonlight, composed in November 2014. Another hand-holding moment captured in the mele Hanohano Kalalau was shared with her dear friend and fellow kumu hula, the late Doric Kaleonui Yaris. Along with friends from the Marquesas, they spent the early morning hours at the summit of Koke’e as Doric recalled his wedding at Kalalau to his high school sweetheart Momilani Gampong Yaris. As they left Kalalau, Kapu and Doric held hands. “First time my husband is hearing this,” she smiled. Three of the younger dancers, Kamalu, Kawehi and Kiana, dressed in yellow and orange pastel dresses, their hair piled high with orange and yellow hibiscus, danced the hula to the beautiful singing by Robbie Lynn. In 2005, in preparation for their performance at the Merrie Monarch, the members of Na Hula O Kaohikukapulani spent hours of hard labor cleaning the Ke Ahu A Laka hulamound in Ha’ena, one of three sacred sites that they have taken on as their kuleana to caretake. Out of this experience came the song Ha’aheo ‘O Makana I Ke Alaula. 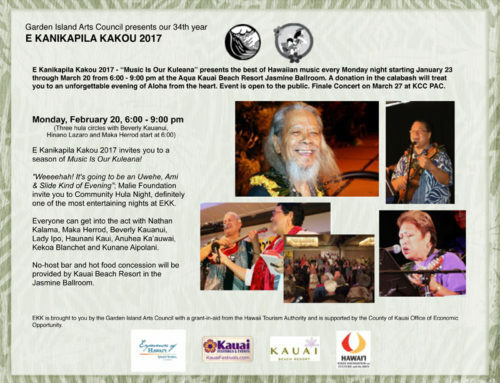 Kapu invited the members of the ‘ukulele circle, who spent the first hour learning this song from Maha Leoiki, to come up to the stage to play and sing the song. Dancers in blue and yellow printed sheath gowns and red hibiscus in their hair danced to this beautiful song. Before the intermission, Maha Leoiki played a lively tune on the Kamoa ‘ukulele that was to be given away this evening. The ‘ukulele was won by a very happy gentleman from Medford, Oregon. 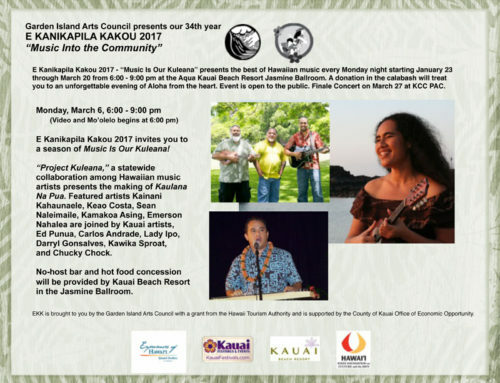 Each week six CD’s are given away to the audience members who took the time to fill in a brief registration survey; Kapu added five of her own Kauai My Island Home CD’s that were added to the giveaway bag. Audience members from everywhere won CD’s – Fran and Mary Ann Romano from Conneticutt, Jan and Kay Wessel from Walla Walla Washington, Renate Westner from Germany, Peter Reis from Tokyo, Laura Hendrichs from Colorado, Angela and Dave from Michigan, Lana Brodziak from Oahu, Debby Winklea from Koloa, Dottie Perry from Hanalei and two more lucky folks. “If your kumu says, you follow!” so when Auntie Bev stepped up to the mic and said she was calling the shots now, Kapu was asked to step center stage and dance the hula to E Huli Makou. “Hike up your skirt and do anything you like,” suggested Auntie Bev. You can’t get better than this with the singing emcee Auntie Bev’s sometimes naughty and always humorous translations, as she hints at the meaning behind the lyrics, and Kumu Kapa so gracefully bringing to life the hidden meaning in the lyrics. Kapu gave a brief history of her personal life; number twelve child out of a family of sixteen children. For her next mele, Kalapaki Oe, she shared the story of her oldest brother, Percy Kinimaka, known as “Mr. Kalapaki,” who was the bright, strong beach boy who ruled at Kalapaki Beach through the 1960’s, 1970’s, 1980’s and part of the 1990’s. Formerly called the Kaua’i Surf, today it is known as the Kaua’i Marriott Resort. As a teenager, she was a beach girl working for Percy’s Beach Concessions and doing all the same things that were done by the other beach boys. All that early training as a beach girl likely paid off building her stamina for the demands on her as a kumu hula. Kaua’i My island Home, danced by five of her dancers, expresses Kapu’s love for her island home, a place where she is making an indelible contribution as a kumu hula and leaving a huge legacy of dancers and musicians who share her love of life, love of island, love of hula and music. For their final number, Kapu shared their harrowing experience on March 11, 2011 riding the bus from Narita Airport to Haneda Airport, a normally one-hour ride that took two hours as the devasting tsunami that ripped apart the Sendai Community was in progress. I remember Kapu describing to me how the bus was lurching from side to side and at that time they were not sure what was happening. The lyrics of Na Pua Mohala (Hana Wa Saku) by Dr. Puakea Nogelmeier and Kalikolihau Paik of Kupaoa with music by Yoko Kanno says that flowers will always bloom, after every Winter there is Spring and sadness will be followed by joy. The music, the hula, the lyrics of this song brought everyone to their feet and many were weeping at the emotions that welled up hearing such a beautiful and heartfelt rendition of this song. All joined hands for the closing song Hawai’i Aloha which always gives everyone a positive lift as they bid each other a hui hou until the next Monday. “Comic Strippers” — Kauai ticket outlet tickets will be picked up by end of business on Friday, February 10. Online tickets at Brown Paper Tickets will be closed at 2:00 pm on February 11. Tickets will be available at the Box Office at 6:00 pm on Saturday, February 11.